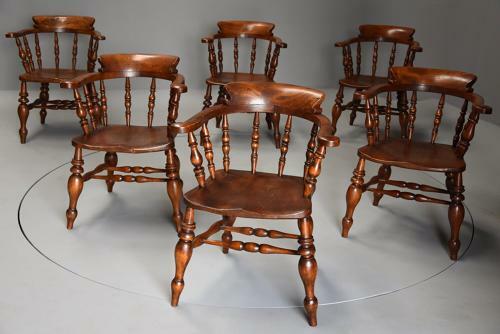 The chairs consist of a deep, shaped back support leading down to broad arms, similar to those found on a broad-armed Windsor chair leading down to eight turned spindle supports connecting the arms to the seat, two of these being arm supports. These lead down to a deep, solid shaped seat supported by turned legs with vase-shaped feet, the legs supported by double H-form turned stretchers. This style of chair was known as a smokers chairs, office chair or Captains chair and are possibly one of the most comfortable wooden seated chairs due to their design. They were often found in offices, men's clubs and pubs due to their robust structure and were produced in many areas in England. Many of these type of chairs were produced in the mid to latter part of the 19th century although evidence shows that they started producing this design from 1849. This set of six chairs are quite rare as they are a true set, they are all in excellent condition for age, are of stable construction and can go straight into a home.